PRAISE REPORT: Our multi-national team of more than 30 trained responders is on the ground in ‪Nepal‬. They are assessing emergency needs in Kathmandu and surrounding areas – focused on shelter, food, water, sanitation and medical care. Samaritan’s Purse has airlifted 42 tons of supplies to Nepal in the aftermath of the catastrophic 7.8-magnitude earthquake that struck the country on Saturday 25 April. More than 7,700 people are known to have died in Nepal, and the death toll is continuing to rise. More than 14,000 people have been injured and tens of thousands are homeless. 4.2 million people are in need of Water and Sanitation Hygiene services, while 3 million people are in need of food assistance. The Samaritan’s Purse disaster response team member that arrived in Kathmandu, Nepal, in the early hours of Sunday morning has seen incredible destruction, death, and need. Buildings have collapsed, debris clogs the streets, people are still unaccounted for, and the death toll is rising daily. Seger spent Sunday assessing the damage in neighbourhoods on the south side of Kathmandu with a Samaritan’s Purse church partner. With aftershocks an ongoing threat – a 6.8-magnitude one struck on Sunday – even those with intact homes are afraid to return. Samaritan’s Purse has deployed a team of 30 disaster response experts, including six medical personnel and we are working with local ministry partners in Nepal to meet critical needs through shelter, water, sanitation and hygiene, and other emergency supplies. The medical team made a reconnaissance trip to a rural area of Gorkha, near the epicentre of the earthquake, and set up an emergency clinic. Medical staff and supplies have also supported mission hospitals that are already Samaritan’s Purse partners. We have sent sending initial supplies for 30,000 households, and will be doing more as the response continues. The quake struck an area between the capital, Kathmandu, and the city of Pokhara, the US Geological Survey said. The earthquake collapsed houses, levelled centuries-old temples and triggered avalanches in the Himalayas. Tremors were felt across the region, with further loss of life in India, Bangladesh and on Mount Everest. It was the worst quake to hit the poor South Asian nation in over 80 years. The quake struck before noon local time and was most severely felt in the capital as well as the densely populated Kathmandu Valley. A magnitude-6.6 aftershock hit about an hour later, and some 60 smaller aftershocks continued to ripple through the region. The strength of this earthquake is eight times more powerful that the one that struck Haiti in 2010. For those who are desperately searching for loved ones. Pray that families will be united. For the immediate emergency response -for safety and strength for those who are on the ground, searching through the rubble. For wisdom for international relief organisations as they consider how best to respond. 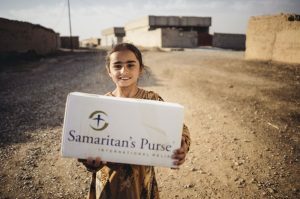 That our God will use Samaritan’s Purse to convey the love of Christ. Samaritan’s Purse partners are already on the ground assessing the situation. We will be seeking to provide emergency shelter, water and hygiene kits in the first instance.